The rating, which considers everything from the start to the end of the journey, was released this month, in the latest report from industry watchdog Transport Focus. The award-winning bus company also scored consistently in the areas of ‘value for money’ and ‘on bus journey time’, standing at 70% and 89% satisfaction respectively. Managing Director at Go North East, Kevin Carr said: “The Bus Passenger Survey independently compares operators across the UK and to be among the top performers demonstrates that customers are pleased with the affordable, quick and easy ticketing solutions Go North East has introduced over the past year. 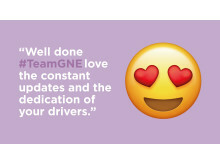 Ratings of Go North East bus drivers’ attitude, helpfulness and greeting jumped for the second consecutive year to 82%, with customer satisfaction levels maintaining 90% and above for the safety of the driving and driver appearance. Respondents to the survey were asked to consider aspects including satisfaction with the bus environment, which saw a steady increase. The Bus Passenger Survey consulted 48,000 bus users across England and Scotland between September and December 2017.